I get a lot of requests for new statistic posts these days and one of the most requested companies is usually Yahoo. 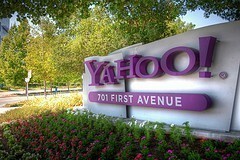 Makes sense since Yahoo is one of the oldest, largest and most visible digital companies around. The problem is, they aren’t all that forthcoming with their stats. Even though they are a publicly traded company, their reports generally focus on financials with just a few cherry-picked users stats mixed in. Even their blog(s) contain very little data and the few user stats they do include on their blog and various websites are usually over a year old. That said, I have been collecting Yahoo stats all along and now have enough to make a post. Here are the more interesting Yahoo statistics I was able to dig up. As always, I will be updating and adding to this post as more stats become available, so be sure to check back often. Please note that some of these numbers are easier to find than others. A few of these Yahoo stats come from Yahoo’s own reports, but some are based on news reports and not official company tallies. Basically, this is the best I can find and I don’t guarantee anything to be 100% accurate.